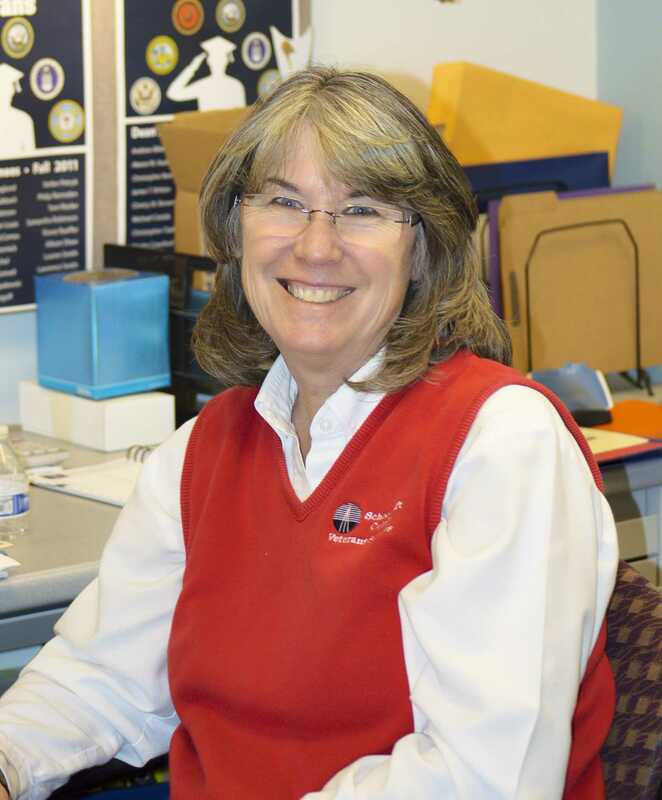 Located in the Career and Disability Center, Veteran Services Coordinator Pam Keehner may not have served in the military, but pays her respects to our armed forces by working with Schoolcraft’s veterans to help them reach their goals. Keehner, originally from Indiana, received her bachelor’s degree in Psychology from Indiana University in Bloomingdale, IN. After serving as an academic advisor in the counseling department at Schoolcraft, she assumed the position of Veterans Services Coordinator when her predecessor retired in 2009; just before the new Post-9/11 GI Bill was introduced. At this time, the mere 100 students that used Veteran Affairs (VA) benefits grew into over 250 students in a few short months. Pam Paxton-Keehner in her office in the Veterans Services Center, located in the McDowell Building. Photo by Lynn Wigand. “I am the single point of contact for all the veterans, service members and dependents. Whatever they need help with, whether it is Financial Aid, or transcripts, or anything at all, they can come see me and we will find the answer together. I don’t just point them in a direction or tell them that is someone else’s job,” said Keehner. While Keehner does academic advising, problem trouble-shooting, and orientation for new veterans, her job is closely linked with Veterans Services Office Clerk and Schoolcraft Certifying Official Kristin Busche, who handles much of the day-to-day data entry and monitoring of the 250 veterans using benefits. As a team, they make sure that veterans are selecting the right courses and know the VA’s requirements for what is allowed. Because the transition from military to civilian life is easier for some than others, Schoolcraft has counselors that are ready and able to assist those struggling with the transition or with personal issues. “As an older applicant I was full of questions but more than that she helped me feel like I belonged here despite the age difference. I can’t thank her enough for caring,” said Schoolcraft student veteran Matt Murphy. Keehner encourages veterans to stop by her office at any time, whether they need help or just want to say hello. Space has also been allocated for a Veterans Resource Center in the McDowell Center to be completed during renovations. “I am very excited about being able to offer a space for the vets to hang out, do homework or obtain information about other community resources available to them,” said Keehner. On Veteran’s Day, Nov. 11, a fundraiser will be held at Henry’s to raise money for Piquette Square, which supports homeless veterans in our area. For a $1 donation, people will be able to sign a large yellow ribbon poster to show support for our veterans. Donors will receive a cookie and a “Support the Troops” bookmark as well. In addition, Toni Moses from Disabled American Veterans will also be hosting informative sessions on Mondays in November. Moses is the Department Service Officer and can assist veterans with any questions regarding other VA benefits, such as pensions, vocational rehabilitation, disability, and other entitlements. November may be the designated month to honor our veterans, but students should remember to keep soldiers in their thoughts. Even if one is not directly related to the military, like Keehner, they can still play an important role in serving our country.